The temperatures may be dropping here in Central Florida but the heat is on at Total Sprinkler and Lighting. We’re working double time to make sure your irrigation and landscape lighting systems are working properly and are ready for the new year. This includes last minute system installations, revamps of outdated systems, and additions to existing systems. Whew! So what are folks lighting up these days? Just about everything you can think of. 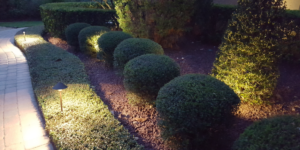 We’ve got wall-washing on home facades, up-lights on small trees, cross lighting on large trees, and path lighting on border plants. 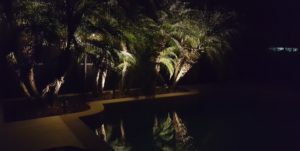 A really great project we did recently included lighting up a cluster of Robellini palms inside a pool enclosure. What a beautiful outcome! The subtlety of the light and the reflection of the palms on the water now give the outdoor area the drama it was lacking. Entertaining around the pool just got a big step up. And since LED bulbs were used, the homeowners can enjoy their new lighting without worrying about an uncomfortable increase in their power bill. Total Sprinkler and Lighting is here to make your home or commercial property a place of beauty and comfort. Call us today to schedule a review of your existing system or to talk about the installation and design of a new one.